Let me just state the obvious: Every single dollar Congress gives these three companies will be flushed right down the toilet. There is nothing the management teams of the Big 3 are going to do to convince people to go out during a recession and buy their big, gas-guzzling, inferior products. Just forget it. And, as sure as I am that the Ford family-owned Detroit Lions are not going to the Super Bowl — ever — I can guarantee you, after they burn through this $34 billion, they’ll be back for another $34 billion next summer. Still, Moore is naturally concerned about all the jobs at stake. He argues the government should buy GM and the others — that it isn’t worth loaning GM $25 billion because they could buy all the common shares for $3 billion. Hard to argue with that, although people will try. I’m sentimental about Detroit’s incredible legacy in the same way I’m sentimental about a lot of other aspects of disappearing Americana. But it also strikes me that we are a little out of control in our selfishness about perpetuating our driving behavior in this day and age. Other vanishing aspects of our life such as the North and South Poles, Western Alaska coastal villages, polar bears and other wildlife deserve some respect and attention, too. I’ve been bike commuting for almost two years now, but I also have four cars [three of them American]. I’ve cut my annual driving mileage way back, so if I stick with it these cars ought to last a long time. Bicycles have come a long way. There are cargo carrying bikes out there, bikes with fat balloon tires that roll right through snow, bike tires with 300 studs each, and really good lights, clothing and accessories. To anyone in reasonable physical condition it’s completely doable, and even a lot of fun and fitness-inducing. You just have to lose all of the excuses you’re fronting for not trying. Dear Anchorage Bicyclists, I live in fear every day that I will run you over. The law requires a bike rider to obey traffic laws when riding in a driving lane, but I am on constant alert when you ride next to me. You act like a car when you want to and a pedestrian when you see fit. You occasionally obey traffic laws, but then cut across three lanes of traffic to make a left hand turn against the light. You ride in the lane then the sidewalk and then back into the lane, never looking to see if we are on a collision course. You say “It is your job to watch me. If you hit me, it is your fault.” My stomach churns when you dash up next to me and cut me off at a right hand turn, even though I was there first. The common courtesy of hand signals seems to have evaporated and now I am supposed to read your mind. I have never seen two bike riders operate their vehicles the same way. It’s no wonder so many drivers are angry. You scare me more than I scare you. If we hit each other, I win a horrible game and both of us are dead inside forever. Read the law and follow it. Save your life and mine. In response to the letter to the editor printed Oct. 27, “Discourteous motorists have been bullying cyclists around too long,” I have a few things to say. I am a very aware and courteous driver when it comes to sharing the road, but all too often I have been driving and come along a bicyclist riding in the road when there is a perfectly good bike trail not three feet away. Why did our state spend the money to make riding around town more safe for them if they are not going to use it? The courtesy works both ways. I am willing to share the road when necessary, but when there is a bike path, cyclists, please use it! There are two types of cyclists — recreational riders and commuters. It’s the commuters, the more seasoned, capable and daring who raise drivers’ ire. I can understand it, but also note the law says cars and trucks have to share the road with bicycles and all kinds of other slow moving vehicles [horse carts, snowplows, farm tractors, etc.]. A strict following of the rules would mean the bike commuter would ride her or his entire commute on the side of the roadway, except roads where bikes are specifically prohibited [freeways like New Seward and heavy use arterials such as parts of the A and C St. corridor]. 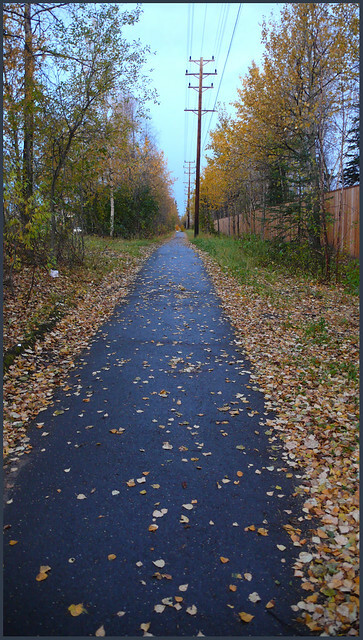 The “bike trails” Ms. Virgin refers to are actually also mixed use routes and are for pedestrians, bikes, skiers, sleds, and anything else without a motor. These routes often parallel major arterials but they also often veer off into the woods, or end inexplicably or merge into sidewalks. They are also harder to ride, being less well maintained than traffic lanes and with lots of hazards like ruts, rocks and dust and broken glass; and they’re typically less frequently snowplowed in winter [they used to be not snowplowed at all before the Begich administration]. Any analysis of possible commute routes would show you’d need a combination of trails, roads and sidewalks to get from points A to B. I try to stay out of traffic lanes except for side streets, unless there’s no choice for part of the route, or there is sparse car traffic at the time. The potential for conflict abounds at intersections. They can be confusing anyway — add cyclists and it gets a little worse. The situation Nikishka describes — a bike coming from behind in the far right side of the RH lane, and going through probably is the cyclist’s fault. But was Nikishka bothering to signal her intentions, either? Both writers sound like they’re genuinely concerned and desire to avoid conflict, and don’t approach this with a “we own the roads” attitude. I can tell you that for every driver like that there are a couple of others who are idiot a-holes. Tonight a little after 5 I was sitting at a light on my bike at the SW corner of 15th and Gambell. Another cyclist came up the hill on the east side of Gambell, on the sidewalk. He got to the corner, dismounted and waited for the walk signal. Right after the light turned he stepped into the intersection. This guy did everything by the book, I swear, but rather than stop and yield, no less than 10 cars turned left from Gambell onto 15th, right in front of the guy. He clearly was wanting to cross. He’d take another half step in, and three more cars would turn right in front of him. All 10 should have been cited for failure to yield! That is more often than not what happens. 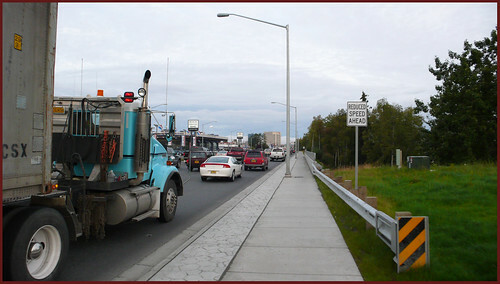 Anchorage drivers are notorious for not yielding, not signaling, making improper lane changes, passing on the right, driving over the speed limit and any other violation you could name. We’re almost proud of it. I’ve seen a lot in nearly two years of year round bike riding a 13 mi. RT route to work. And I grow tired of all these letters that make it sound like the cars are behaving and the bikes are not. I’d challenge any of these people to commute by bike for six months and then write the same letter again. Update: 39 year old instructional video! via Cyclelicious. In regard to the use of bike paths, dear motorists: As a bike commuter, I love bike paths when one is available and usable. Motorists, please realize that even though a path or route may exist, it does not mean it is accessible and without hazard. Some paths suddenly end, forcing the rider onto the road, sometimes over a curb. Other paths are so full of roots and cracks that riding is difficult and perilous to bike tires. 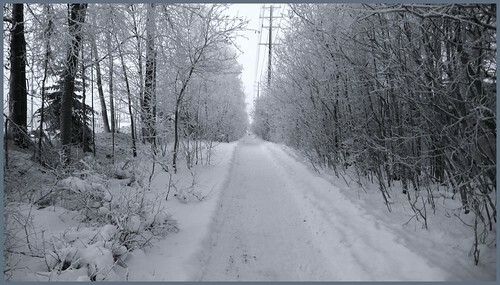 And most paths spend much of the year covered in gravel and snow. Did you know the sidewalk along Minnesota Drive is a designated bike route? However, it is better described as a dirt path, full of glass and usually cleaned once a year … in July. Never mind that it is narrow, shared with pedestrians and incredibly dangerous, considering the numerous side roads and turning vehicles. 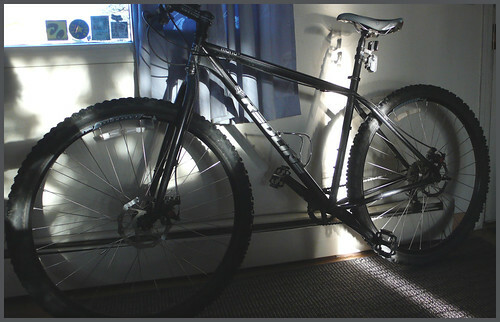 As a year-round bike commuter, I analyze my routes and determine them according to safety. If you see me on the road and not three feet over on a path, know that it is the best choice and one I have made legally. Update 3: from Seattle, an intricate Q&A about bike and car interaction in traffic.